Bengaluru-headquartered public sector lender Vijaya Bank on Thursday reported a nearly four-fold jump in its net profit to Rs 230.28 crore for the third quarter ended December 31, 2016. The bank will follow the guidelines set by the FM Jaitley Budget 2017 i.e. focusing on key sectors like the Farm Credit; Housing Sector (Affordable) and Infrastructure. The bank had reported a net profit of Rs 52.61 crore in the corresponding quarter, last year. 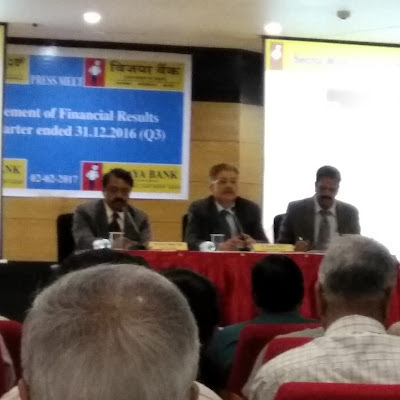 Vijaya Bank Managing Director and Chief Executive Officer Kishore Kumar Sansi said, “From the last six quarters, we have been doing very well. The strategy is to concentrate on retail business, improve NIM (net interest margin), and not to concentrate much on topline at the cost of profit.” “That is how, we have been able to reduce our high-cost deposit... almost to negligible. Then, reorientation from corporate credit to retail has given few more dividends and coupled with good treasury profits,”Sansi explained. Vijaya Bank Executive Director B S Rama Rao said, “It is a temporary phenomenon, which does not affect the demands of the corporate sector. However, the bank does not visualise any improvement in the economy as of now.” Provision coverage ratio increased to 55.44% and retail advances increased to Rs 27,284crore,up by 22.88%. As on December 31, 2016, the bank has 2,030 branches and 1,865 ATMs. Vijaya Bank’s stocks jumped 19.78% to Rs 63.90 a share on the BSE.